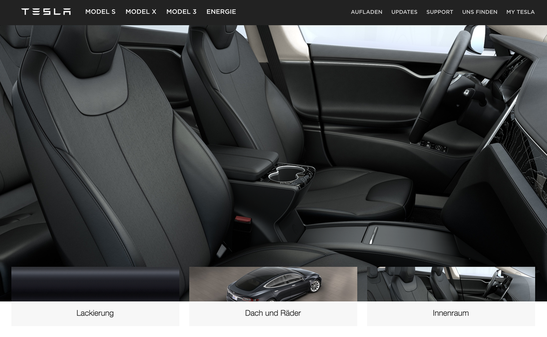 The "perfect" configuration - buy-teslas Webseite! In the case of the battery, the target often is "the larger the better". If you want to travel very long distances and your area does not have a good coverage with superchargers or you can easily spend the required money, then in my opinion you should get the largest possible battery (currently 100 kWh). However, the 75 kWh battery offers the best price/performance ratio. I have chosen the 75 battery and I am extremely satisfied with power and range of my model S (at least 300-350 km of range and more than enough power). I think the "Autopilot" functionality is awesome and fascinating and especially for longer drives on highways it is a practical help to arrive at the destination safely and relaxed. Since some time now the AP 2.0 functions are very usable and make it easier for me to drive on long distances. The good thing is that the "Autopilot" functionality can also be upgraded after delivery. If you are undecided, you can omit this feature at the time of purchase and then upgrade it later. Should I order the "Premium Sound" package? I was faced with the choice, whether I would buy the car with the standard sound or if I would like to buy the "Premium Sound" or "Super High Fidelity sound package" for a relatively large amount of money (2800 Euro at the time of my order). I finally decided against the sound package. The sound is audibly better than the standard sound (especially in the bass range) but the improvement is not worth 2.800 Euro (or 2,500 USD) to me. Some time after I received my Model S, I decided to make some small conversions to the speakers in the care to improve the sound even further. The overall sound improvement costed less than 1,000 USD and was definitely worth the money and effort. Premium upgrades package: I like the "Bio Weapon Defense Mode" that comes with this package but in my opinion the overall package is not worth the upgrade price since it adds too little. Subzero Weather Package: I would only recommend this package to buyers who live in very cold countries. Due to the possibility to preheat the car via the app and the good & fast heating of the seats, I have not missed the functions of this package at all. Wheel Size: To me the better efficiency and lower cost of the 19" wheels (and tires) is more important than the slightly better look of the 21". With 21" rims, you often have the problem that you quickly get damages at the curb. For this reason, I decided to buy the 19" wheels. I am satisfied with the ride comfort and appearance of the standard 19" wheels.